Proving once again that Universal/Rhodes is one of America’s best manufacturing companies, we are the first New York manufacturer of precision surfacing materials to receive certification under the 9001:2000 standard in 2001. Currently we have received latest version certification of ISO 9001:2015 standard. Internationally recognized with four accredited international registrations, this latest achievement continues to validate JH Rhodes Company’s “Yes We Can” commitment to quality and continuous improvement. Whether supplying products to polish the Hubbell Telescope or for producing computer chips, the world’s largest corporations lead their markets with JH Rhodes’ high performance products. The International Organization of Standardization (ISO) with headquarters in Geneva, Switzerland, is made up of national standards institutes in 162 countries. The organization promulgates worldwide commercial and industrial standards. 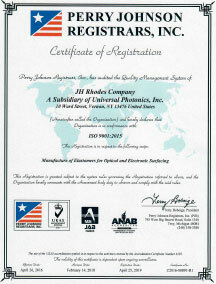 To be certified as meeting one of these standards is to be a quality player in the global marketplace. What does the ISO 9001:2015 describe? The ISO 9000 standard provides systematic control of a company’s activities to ensure that the needs and expectations of customers are met. Since the introduction of ISO 9001 in 1987, changes have been implemented by the international committee to reflect changes in business. The governing board for ISO addressed this in the 2008 and 2015 revisions which implemented a systems approach to quality management, increased control of outsourced operations, and alignment with the ISO 14000 environmental standard. Why is ISO Certification so important? ISO certification is accepted as a global standard for quality system management. The ISO standard safeguards customers and users of products and services, ensuring operational consistency and reliability. It demonstrates the existence of an effective quality management system that satisfies the rigours of an independent, external audit. ISO 9001 certification enhances company image in the eyes of customers, employees and shareholders alike. For JH Rhodes Company, achieving ISO 9001:2015 certification supports our ongoing commitment to quality, customers and improvement. Our ISO certification provides measurable assurance from an independent authority that our Quality Management System is consistent and dependable, enabling continuous customer satisfaction. JH Rhodes strives to continuously improve our quality system in order to fulfill our commitment of providing quality products that meet or exceed our customers’ expectations.